Did you know that October 15 is White Cane Safety Day? Did you know motorists have to stop for a blind pedestrian carrying a white cane or accompanied by a guide dog? It’s the law. 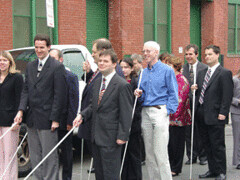 White Cane Safety Day is a holiday celebrated on October 15th of each year, since 1964, in the United States. The date is set aside to celebrate the achievements of people who are blind or visually impaired; an important symbol of blindness and a tool of independence. On October 6, 1964 a joint resolution of the U.S. Congress was signed into law. This resolution authorized the President of the United States to proclaim October 15th of each year as “White Cane Safety Day.” President Lyndon B. Johnson signed the first White Cane Safety Day proclamation within hours of the passage of the joint resolution. Today, an impressive number of blind or visually impaired people have achieved sufficient independence to travel alone through the busy highways of our nation displaying their white canes. A long time ago it was rare to see a blind person on the street, now it is common to see blind people on the street, the workplace and utilizing assistive technology to perform daily activities. The white cane is a symbol of independence, of how the blind are able to compete with all others in society, and their determination to be free.